How to get there: From Linz, take A1 towards Salzburg and change over to A9 towards Graz. Continue to St. Michael. Exit here and continue on freeway (S36) direction Klagenfurt (south-west). Pass Knittelfeld and locate the proper exit for Hwy. 78 going south shortly after Knittelfeld. Go south on Hwy. 78. Shortly, you will locate a traffic circle where Hwy. 78 intersects Hwy. 77, measure from this traffic circle. Go left in this circle and drive through Weisskirchen. Continue east on Hwy. 77 to kilometer 3.4 where you turn right. There are signs for Hirschegg and Kleinfeistritz. At kilometer 10.0, you are in Kleinfeistritz, make a right and continue towards Hirschegg. At kilometer 17.5 the paved road changes to (a good) dirt road (2007). 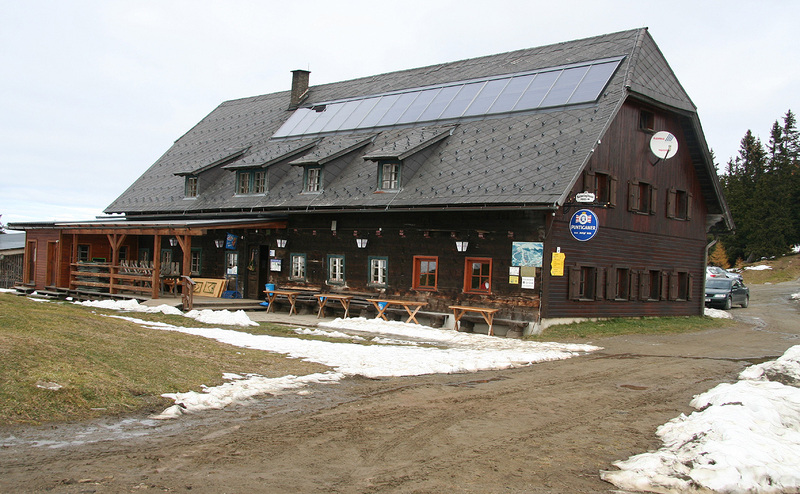 At kilometer 21.0, you have reached the highest point on the road, turn right and park in front of Salzstiegelhaus. This is the trailhead, location N47:04.088, E014:52.285, elevation 1553 meter. This friendly place is open year all year and I had a pleasant stay there. Highly recommended. 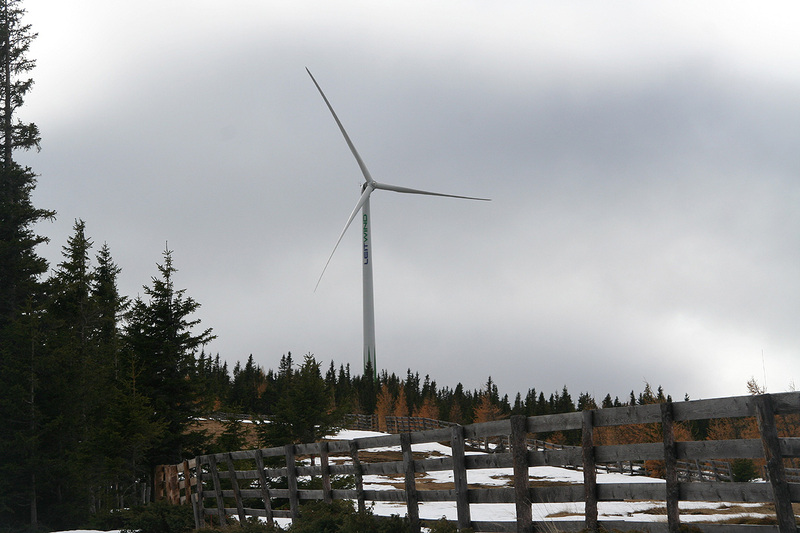 Route description: From the Salzstiegelhaus, head uphill along the trail or along the parallel dirt road towards the top of the first slope, easily recognized by a huge windmill. 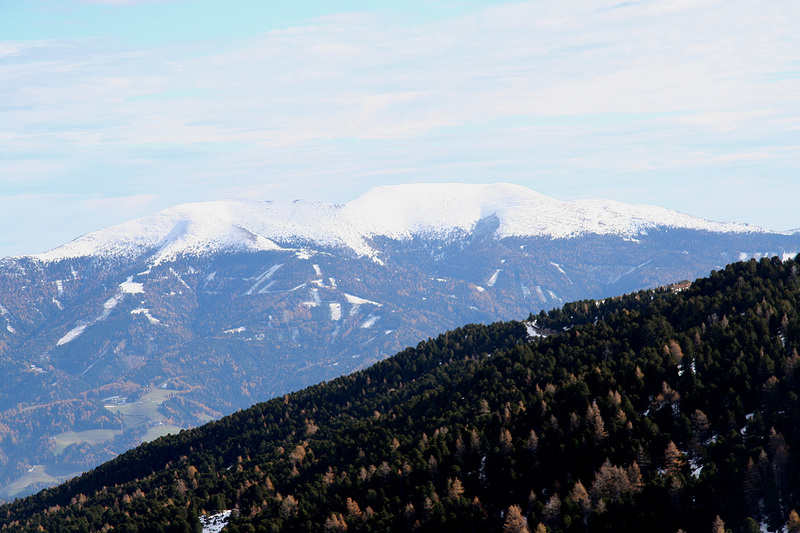 This location has elevation 1713 meter, and is the top of the ski area served by permanent lifts. From here, you see Speikkogel, 1993m right uphill. Continue on a good trail to this summit. From Speikkogel, the trail descents slightly a bit westward to a local saddle giving Speikkogel a prominence of about 50 meter. Continuing west, the trail first ascends to a ridge of about 1980 meter, then ascends further to Hofalmkogel, elevation 2040 meter, a fairly level ridge, having prominence of about 30 meter. The trail continues via the local saddle (approx. 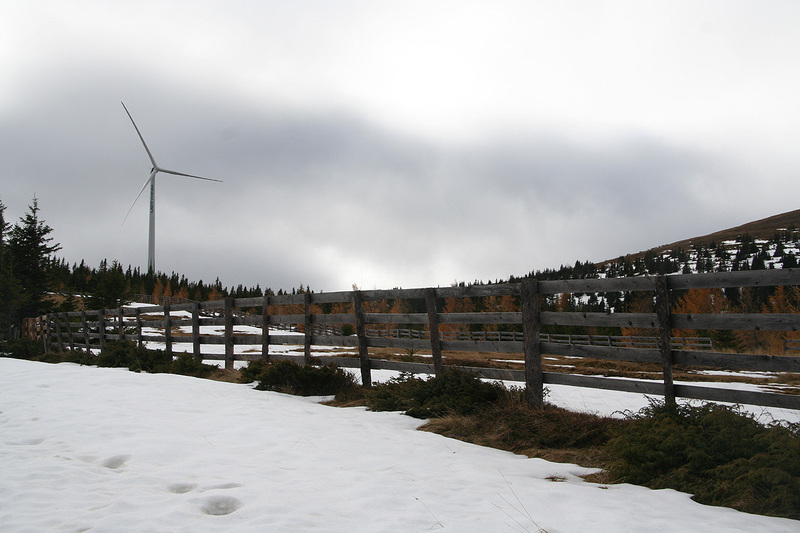 2010 m) and then ascends the south end of Ameringkogel, a shoulder at 2160 meter, named Weissenstein. 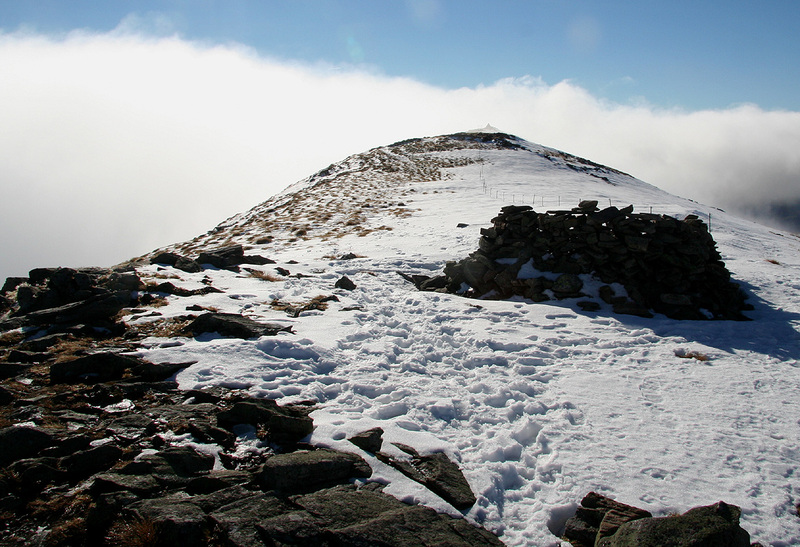 What remains is to follow the broad ridge north to the summit of Ameringkogel, quite close. One should note that the highest point is marked by a cairn on the south end of the summit ridge, while the summit cross is located at the slightly lower north end of the summit ridge. It is clear that this route from Salzstiegelhaus along the broad and gentle ridge to Ameringkogel is a very nice route for cross country skiing. 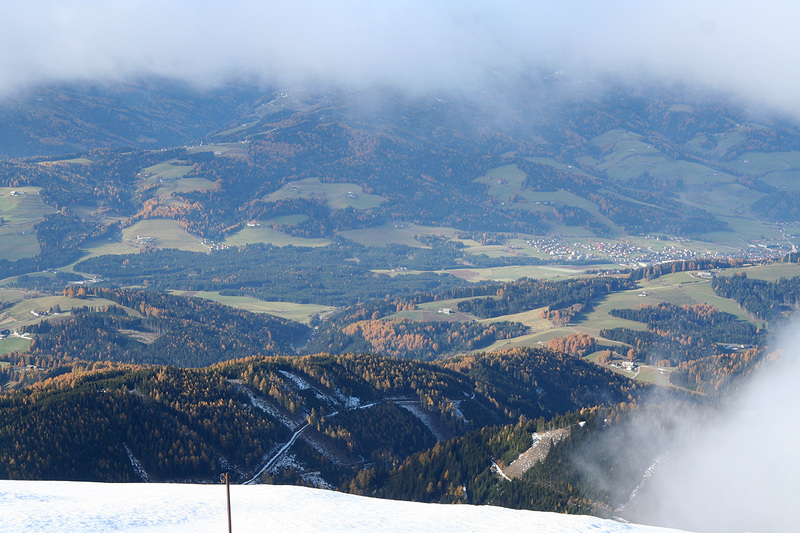 Unfortunately, there was not enough snow to ski when I visited this nice area. Comments: I started out after a nice breakfast at 0730. Unfortunately, the sky was completely clouded and it seemed clear that my route would head up and into the fog, since the nearby Speikkogel disappeared into the clouds. With very limited visibiity, I still enjoyed the walk and carefully recorded the local hills and saddles along the way with my GPS unit. It was therefore quite a memorable moment as I at least partially emerged above the clouds while ascending the last ridge to the south shoulder (a point called Weissenstein on the map). A few more meter along the ridge and I located a cairn that, according to my GPS, was slightly above the official elevation of the summit. I took a brief rest and noted that the continuation of the ridge (north) was still in thick fog, while I now and then could look down west towards the village of Obdach, where the saddle at 955 meter is located. While I had experienced both wind and fog on the way here, the summit was completely calm and at least partially sunny. After a while, I considered to go back down or to continue at least a little more along what looked like a fairly level summit ridge. I decided to explore the ridge a bit further and was mildly shocked when seeing a summit cross emerging from the fog. 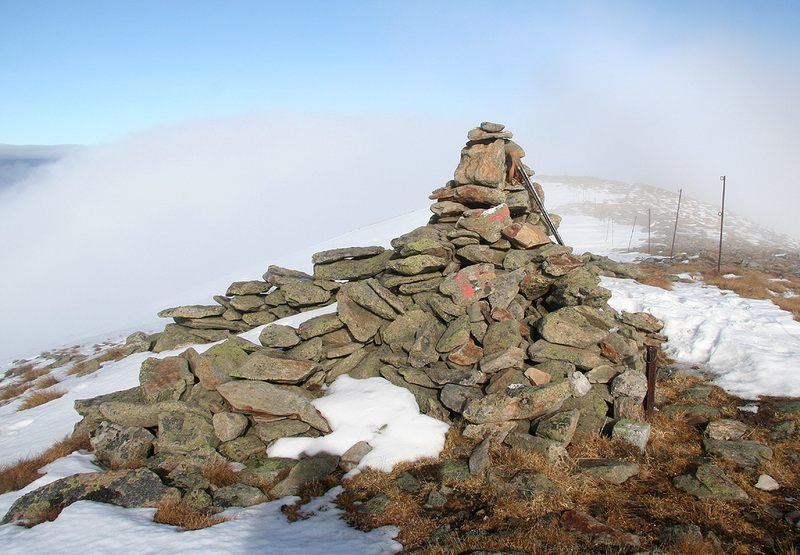 Here I had climbed to the summit, located a cairn and been perfectly happy. "You are in Austria", I said to myself. 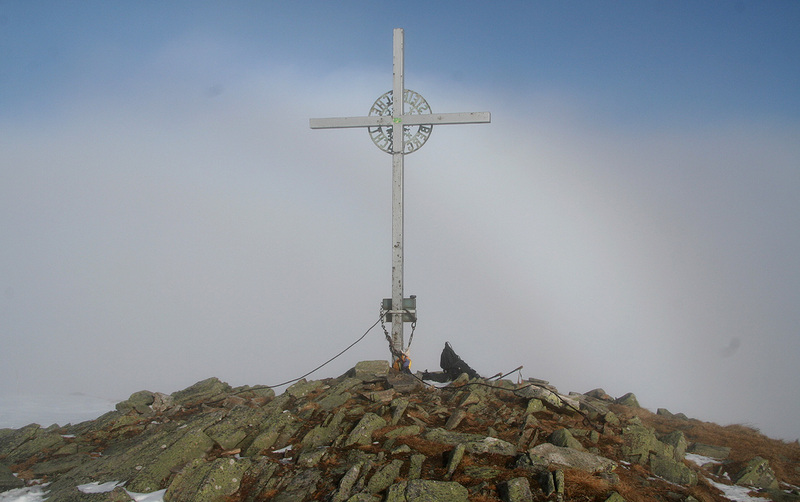 "You are supposed to look for a summit cross, not a cairn." What if I had turned only 100 meter short of the true summit? Almost worse than my experience with "false summit cairns" in fog back in Norway. However, as things turned out, I measured the elevation of the summit cross to be a couple of meter lower than the cairn, but such small differences could equally well have been the other way around. I signed the summit register and had a new small break. This was definitely the end of the summit ridge as the terrain sloped downwards further north. For a brief moment, I could see back to the cairn, as the clouds kept changing. This mountain was currently the local weather divide, all clouds to the east, better to the west. The clouds kept trying to flow across the ridge, only partially succeeding. I headed back down around 1000. Descending, implied getting back into the fog. I first observed two mountain goats, the wind was unfavorable so they detected me as well. A bit further ahead, before getting back to Speikkogel, I met a few hikers, obviously this route is quite popular even on a foggy day. Descending further from Speikkogel, I came out below the clouds, there was even some visibility to the north. I was back at the lodge by 1135. Thus, it would be easy to drive onwards and locate a good place to stay in preparation for the climb of Hochobir, planned for tomorrow. Ameringkogel, as seen while ascending Zirbitzkogel. New and old, below Speikkogel.